Scientists with the Deep Carbon Observatory (DCO) are transforming our understanding of life deep inside the Earth, and maybe on other worlds. Their discoveries suggest that abundant life could exist in the sub-surface of other planets and moons, even where temperatures are extreme, and energy and nutrients are scarce. They’ve also discovered that all of the life hidden in the deep Earth contains hundreds of times more carbon than all of humanity, and that the deep biosphere is almost twice the volume of all Earth’s oceans. The DCO is not a facility, but a group of over 1,000 scientist from 52 countries, including geologists, chemists, physicists, and biologists. They’re nearing the end of a 10-year project to investigate how the Deep Carbon Cycle affects Earth. 90 % of Earth’s carbon is inside the planet, and the DCO is our first effort to really understand it. The rate at which Greenland is losing its ice is accelerating. This unsurprising conclusion comes from a new study based on 25 years of satellite data from the European Space Agency. The new study was published in Earth and Planetary Science Letters. A meteor that exploded in the air near the Dead Sea 3,700 years ago may have wiped out communities, killed tens of thousands of people, and provided the kernel of truth to an old Bible story. The area is in modern-day Jordan, in a 25 km wide circular plain called Middle Ghor. Most of the evidence for this event comes from archaeological evidence excavated at the Bronze Age city of Tall el-Hammam located in that area, which some scholars say is the city of Sodom from the Bible. We Have the Technology. Airplanes Could Spray Particles into the Atmosphere to Battle Climate Change. But Should We? If climate change models are correct, humanity is working itself—and dragging the rest of life on Earth with it—into a corner. Scientific pleas to control emissions and battle climate change are starting to have some effect, but not enough. So now we have some tough decisions looming. Earth’s last great ice age, known as the Quaternay Glaciation, began roughly 3.2 million years ago. This period was characterized by the expansion of ice sheets out of Antarctica and Greenland, as well as the fluctuation of the Laurentian ice sheet, which covered most of Canada and the United States. The retreat of this glacier is responsible for the creation of millions of standing bodies of water across North America, including the Great Lakes. While the causes of ice ages have been attributed to a combination of astronomical cycles, atmospheric conditions, ocean currents and plate tectonics, a complete explanation has been lacking thus far. 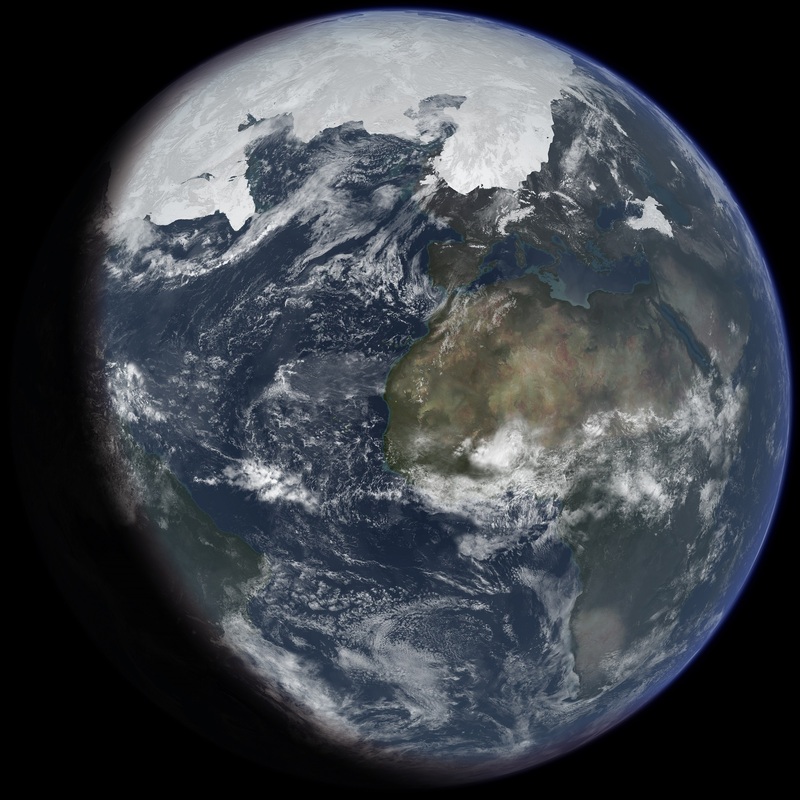 However, according to a new research findings by a team of Rice University geophysicists, Earth’s last ice age may have been caused by shifts in the Earth relative to its spin axis that caused its poles to wander. An international team of scientists have discovered what lay hidden under Arctic ice for thousands or even hundreds of thousands of years. Using data primarily from NASA’s Operation IceBridge, they discovered one of the 25 largest impact craters anywhere on Earth. And its discovery may re-ignite an old climate debate. It’s always wise to be prepared for a disaster, but space sperm is taking it a little too far. Having things like food, water, and medicines on hand constitutes a reasonable level of preparation. But now one company wants to freeze your eggs and sperm in space. We have comets and asteroids to thank for Earth’s water, according to the most widely-held theory among scientists. But it’s not that cut-and-dried. It’s still a bit of a mystery, and a new study suggests that not all of Earth’s water was delivered to our planet that way.